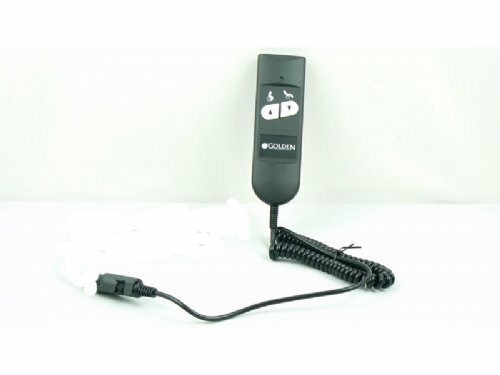 Okin Hand Control Straight Connector, Light, No Extension Cable . p112c or 6212, or 1.11.000.186.30, or 1.11.000.187.30. Okin Hand Control With Straight Connector, No Extension Cable Included. This is used in Golden, Med-Lift Lift, Lazy-Boy Chairs and others and plugs in the pocket. ON SALE. We may ship a new replacement model that looks slightly different in appearance. The terminal connector is a round 5 pin PIN connector to match up to your extension cable which also has a round 5 pin PIN connector and a bail that flips over the two studs to secure the connection between the cables. This quick disconnect hand control can have various part numbers depending on the brand of the chair, ie. p112c or 6212, or 1.11.000.186.30, or 1.11.000.187.30, and more.